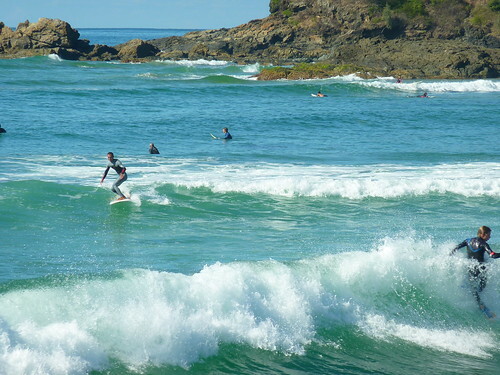 Coffs Harbour was a washout. It may be one of the more upmarket areas of Australia, but every town looks miserable in the rain. We took shelter in the library/art gallery and made use of the free wi-fi, before heading onward. The next day the weather was much better. 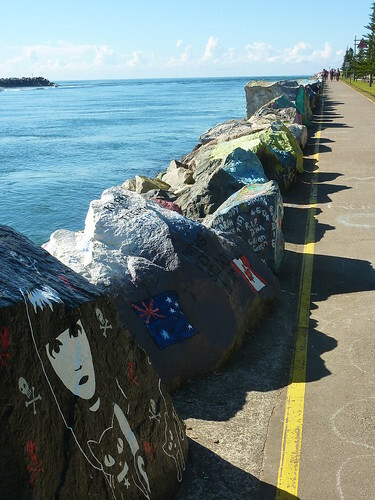 We'd ended up not far from Port Macquarie, the self-proclaimed "Bodyboarding capital of Australia", and took a walk along the coastal path there to take in the hundreds of decorated rocks that lined the promenade. 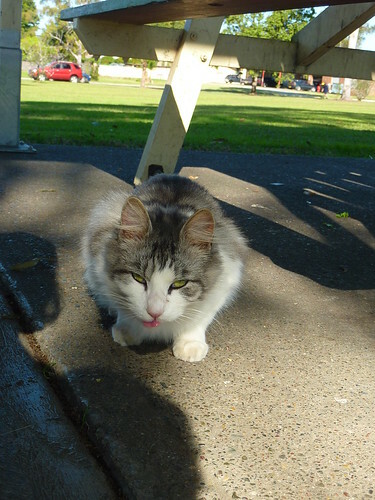 Moving on again, we arrived at Cundletown (Gilly was excited as she'd misread it as Cuddletown), and whilst there was no-one in the park we had lunch at to give us a cuddle, there was a very friendly cat who took a particular liking to our Pringles. 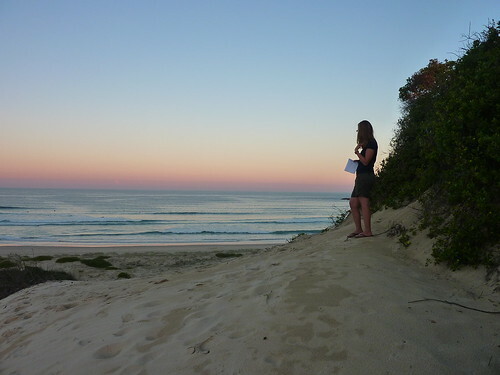 We ended up at Port Stephens, and took a stroll along One Mile Beach adjacent to the caravan park at sunset. One retired chap we met there was taking a trip up the coast and was going to take a leisurely six months to get from Brisbane to the north. We were taking 3.5 weeks to do the entire east coast; a slightly shorter itinerary! 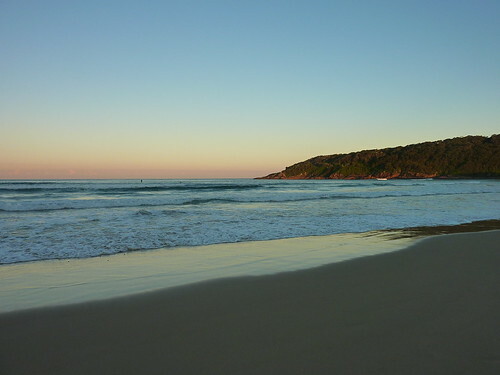 Australia is so big that it is perfectly feasible to spend that much time exploring every inhabited settlement down half the coast, but you definitely need to be retired to do so. 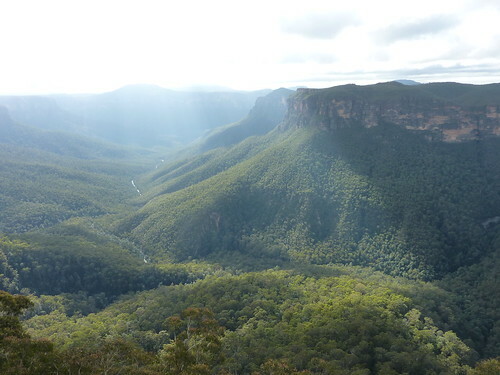 Following Scott and Hannah's advice, we decided to drive up to the Blue Mountains the next morning. We weren't sure what we were going to do or even where to stay, so I tracked down a free campsite for that night and a park for us to meet Paul and Fi at the following day, whilst Gilly looked into activities. 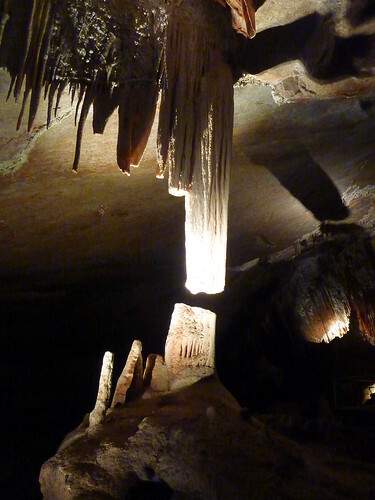 The main attraction in the area is the Jenolan Caves, and by chance we happened to be heading there on the day that a famous cellist was going to be performing in the cathedral of one of the caves. 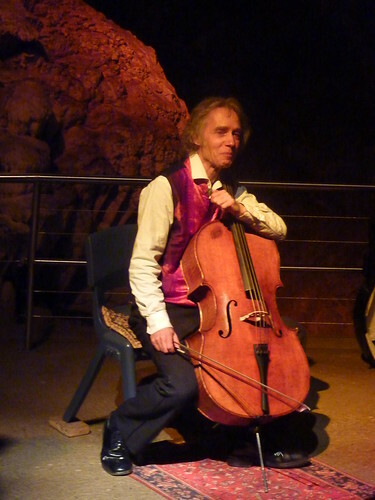 We both enjoy classical music but have never really gone to any performances (something that we'll be doing more of when we get back), so the opportunity to see a solo cello performance in a cave with almost perfect acoustics was too good to miss. 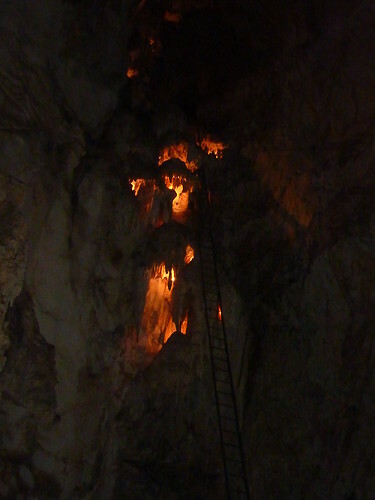 The drive up to the caves was long and took all morning and most of the afternoon. 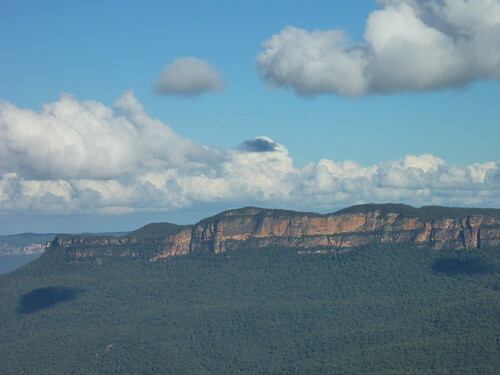 The Blue Mountains are stunning but we couldn't stop for photos as we were racing against time to get to the performance in late afternoon, so resolved to snap some pics on the way back down. 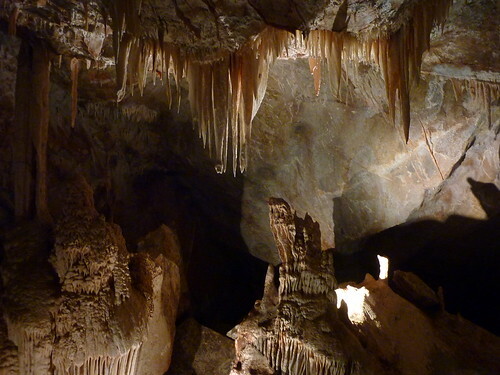 The Jenolan Caves are 340 million years old and certainly look the part. 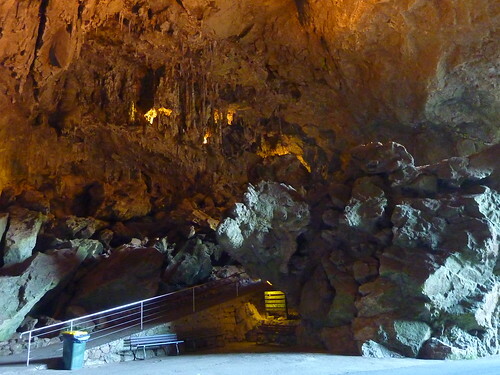 They are split into a number of accessible caves which would take up a couple of days to explore, but we were only going to one - the Lucas Cave. 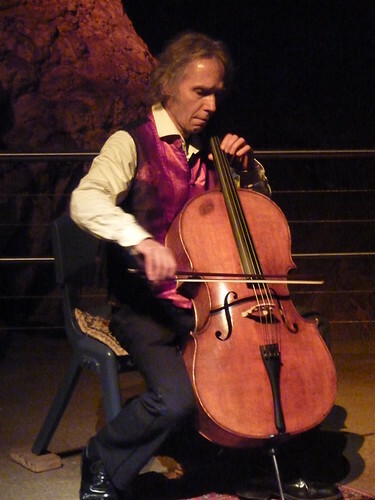 The cellist, Georg Mertens has performed over 150 solo shows for 15 years, which has made history by being the longest series of regularly scheduled cello concerts. He looked exactly as I'd expected a German classical performer to look, waistcoat, Mozart hair, the works. After a brief introduction, he launched straight into his first couple of pieces. and he also performed 4 pieces he had either improvised, made variations to or created himself: Arabian Improvisation, Variations on "Sakura, Sakura", Variations on "Maytime", Didgeridoo (in which he actually made the cello sound like a didgeridoo...incredible) and finally Cathedral Ciaconna, which he wrote to make best use of the acoustics in the cave. It's obvious why performances here are so popular. The cathedral chamber bounces the sound off the complex limestone formations in a way that is near impossible to manufacture without spending stupid amounts of money. Amplification wasn't needed; the cello sang out so clearly that it was impossible not to hear every note. And Georg played it sublimely from beginning to end, giving us a little information about each piece but only enough to keep it interesting, rather than boring us with the detail. After the scheduled pieces were played, he did a couple more - The Swan from Saint-Saens' Carnival of the Animals, and my favourite cello piece: Suite 1 in G Major by Bach. This latter was the piece played by Yo Yo Ma in Noël, the tremendous season 2 episode of The West Wing; it's fairly recognisable, and I was overjoyed that we got to hear it played by a professional cellist. 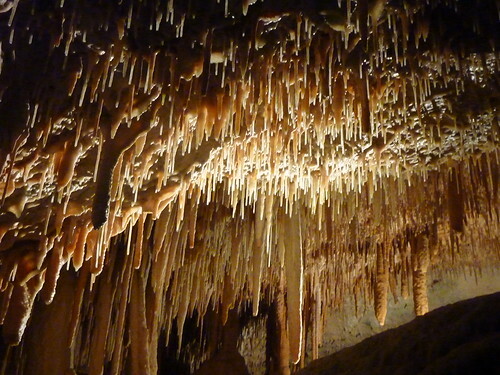 After the show was over, our guide took us around the Lucas Cave for a tour which was unexpected but appreciated. 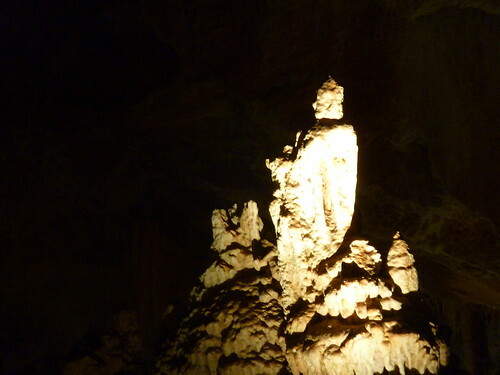 The formations were interesting, and there was less of a touristy feel to the caves which you'd get elsewhere (in Ha Long Bay, for instance). There was even a formation called "The Bishop" that, unlike a lot of fantastically named showpieces, actually bore a slight resemblance to its name. 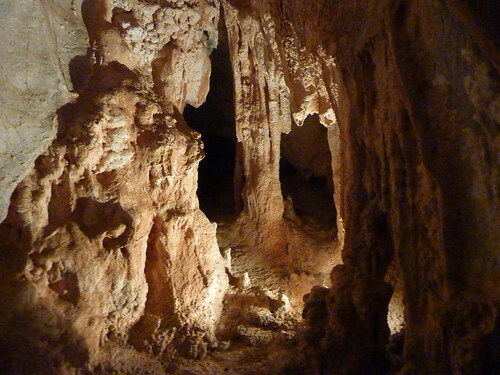 Afterwards, we had complimentary wine and cheese at Jenolan Caves House with Georg and his wife. It was really just a chance for her to sell some of his CDs, and the wine was pretty dire (although the hotel was flogging it to restaurant punters for $35 a bottle...this is why you never go for the cheap bottles when you eat out), but we were glad of the nibbles as we realised once we got outside that a) it was much too remote to find somewhere to eat that wouldn't bankrupt us and b) it was far, far too cold to contemplate cooking outside. 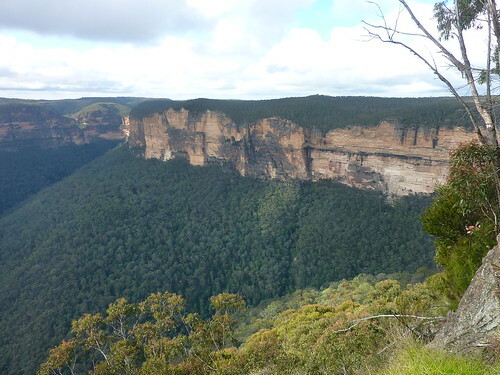 Miraculously after heading back down the Blue Mountains we found what looked to be an abandoned car park and free-camped for the night, under a duvet and fully-clothed, and munching on a bag of crisps we'd thankfully stockpiled. 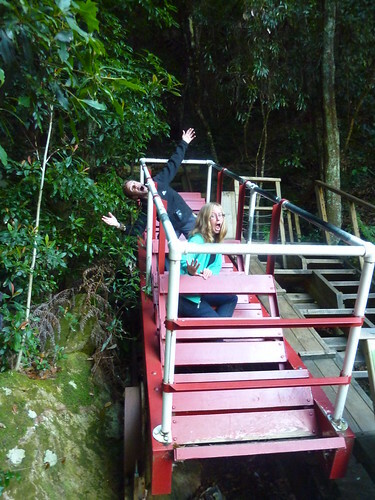 The temperature had dropped so suddenly that we were completely unprepared. We only had a fleece each, and two thin pairs of trousers. After surviving the night, we realised it was time to start investing in winter clothes. It was only going to get colder as we got further south, and we were definitely going to need them in New Zealand. 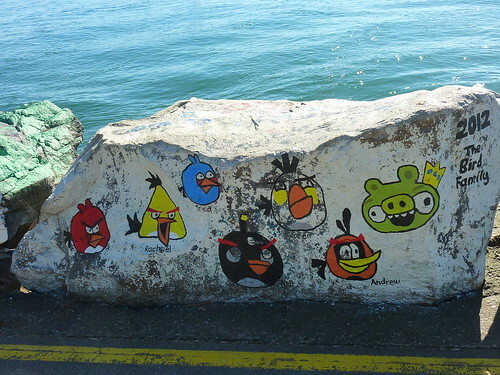 Our next destination was a shopping mall - any shopping mall - but only after stopping to take in the scenery first. 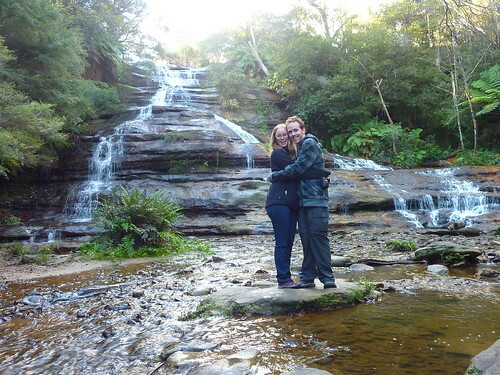 We found a K-Mart in Katoomba and bought jeans, socks, and a hoodie, and said goodbye to the warm weather. 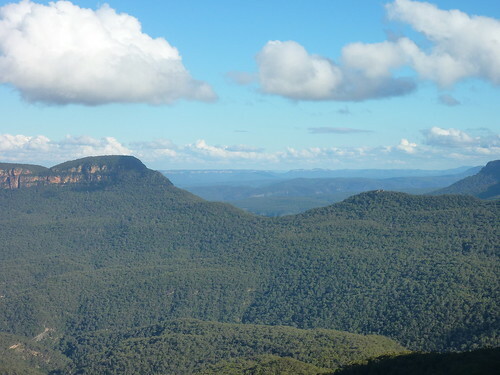 Paul and Fi were en route after spending a couple of days in Sydney, and met us in Katoomba Caravan Park in the afternoon where we caught up over the obligatory bottle of wine or three and planned our next excursion for the following day: the Cascades and Three Sisters. 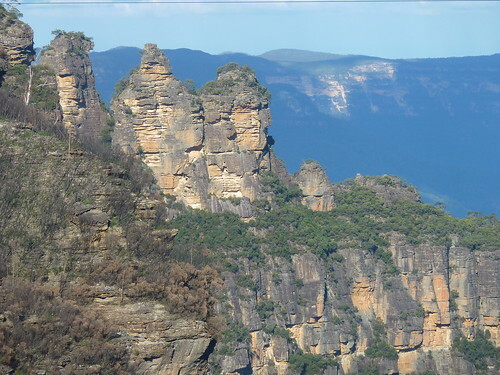 The Three Sisters are three pillars of rock jutting upward from the cliff edge, whilst the Cascades are...well, cascades of water. Not waterfalls though; the water just flows over the ground. 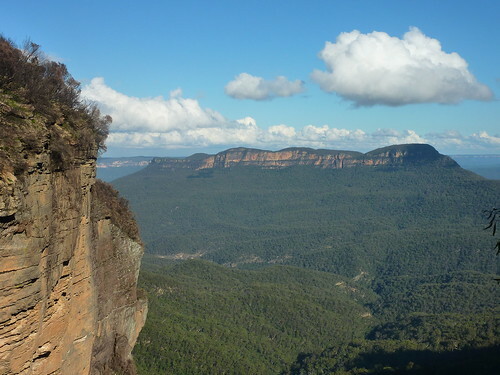 A short walk around the railway grounds followed, covering a bit of Katoomba's history (coal mines and such), and then the experience was all over. If you're really into railways it might be worth a punt, otherwise there's probably better things to spend your beer fund on. We reached Sydney in mid-afternoon, and dropped off our vans at Apollo. Paul and Fi had unfortunately got a dent in theirs when they were parking up near our van (only a scuff on our bumper which Apollo weren't bothered about luckily), but Apollo immediately withheld all of their bond until the damage could be assessed. The dangers of using Apollo Motorhomes deserves a blog post all of its own, which I'll do on my return, but suffice to say that the case is still ongoing. Scott picked us all up from the Apollo office and it was fantastic to see him again. We were staying at his parents' for the duration of our time in Sydney, and they immediately made us feel welcome, gave us a room and fed us chicken schnitzel. It was Hannah's 21st birthday, but she wasn't celebrating as both her and Scott had a paper due in three days later and it was causing them a little bit of stress. 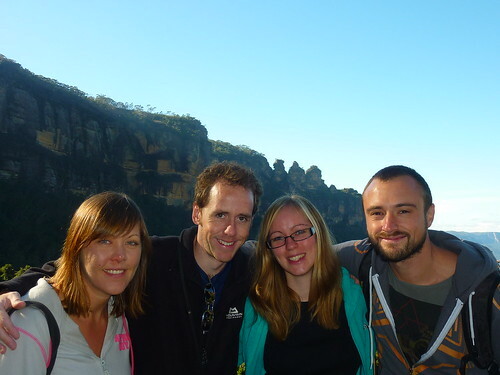 We were happy to explore Sydney ourselves and with our fellow Miltonians until it was all completed, and that's what we set out to do the next day.